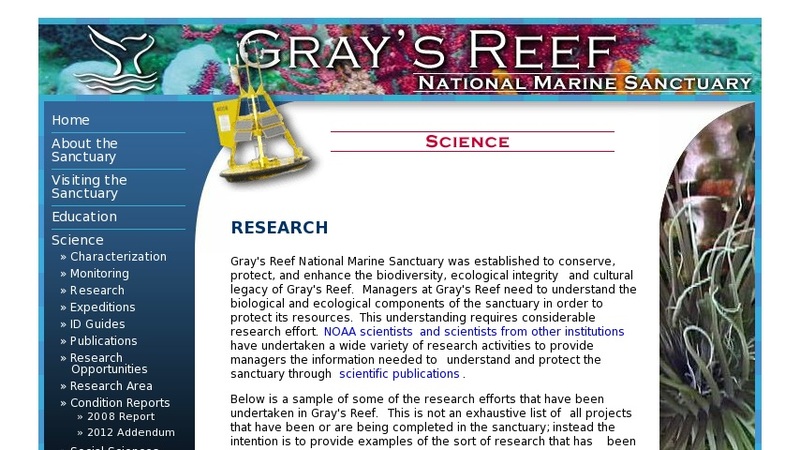 Provides a sampling of research projects conducted at the Gray's Reef National Marine Sanctuary off Georgia's Sapelo Island. Projects range from geology to trawling impacts on the seafloor, estimating fish populations by video transect, Sanctuary monitoring using data buoys, sidescan sonar and other technologies. Examples of current projects: conducting a study on the movement patterns of fish in the area; efforts to understand the roles of "choices" fishes might make in their behaviors, and its impact on diversity of species found in reef fish communities and a study designed to inventory the invertebrates and fish communities and analyze how those communities are impacted by fishing activities. Appropriate for grades 9 and up.